I can't help myself: there is just something romantic about junked motorcycles and cars, especially old ones with a lot of rust. 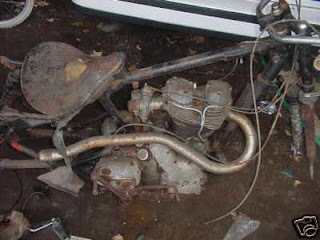 This Royal Enfield offered for sale on eBay as a "parts bike" is that kind of thing. Where has it been? What adventures did it have? How many owners loved it and, eventually, loved it almost beyond salvation. Restorers can bring almost anything back to life. But something in me wants to see machinery that gets to this stage preserved the way it is. It has earned its rest. All it needs now is a prominent place in the garden, perhaps with some flowers. Bright, shiny and new has its place. New motorcycles are all potential. How fast will they go? How long will they last? What adventures lie ahead? But new motorcycles have stories to tell. Since they can't speak, we can only imagine what they might have been. The stories are there, though, if we take the trouble to listen to the romance of rust.